Yesterday very early in the morning I got a call: in the evening, Peruvian time (while I was sleeping in Europe) there had been a 7.9 Earthquake in my country, in MY home city. You can't imagine the feeling. I was told immediately that it hadn't been very big in Lima, that everything was under control and that my friends had communicated with my parents over Internet and that they were ok. However, the pressure I felt in my heart, the punch I felt in my stomach...I cannot explain it. I immediately ran towards the phone and dialled my parent's home number and my dad answered the phone. The moment I heard his voice I started crying, tears rolling down my eyes. Everything was ok. And over that phone line I felt the physical distance, the huge ocean that divides me from my family and my Peruvian friends. I also immediately felt relief. However, I'm not sure if you can actually understand this but instead of feeling good about the fact that I didn't have to be there in such a tough time, I actually felt that I wanted to be there. In fact, I still want to be there. At the moment the after shocks are still going on, and over 300 small tremours have been taking place, a couple of them reaching almost 6 degrees intensity this morning. Lima, the capital city has been lucky and it's been plenty of chaos and people are still scared. However in Ica, 250 kms south of Lima the disaster is massive. So far there there have been 510 deaths and 1500 injured. With over 17,000 destroyed houses, complete families are now homeless resulting in a staggering 85,000 people that have been affected by this disaster. 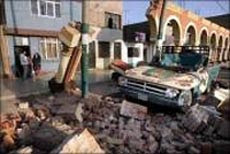 The towns of Pisco and Chincha in Ica have been severely effected with devastation to more that 70% of the area. If you wish to contribute please do so, if you are in another country contact the Peruvian consulate in your country and they should have a bank account where you can make a contribution. For a list of all the Peruvian consulates in the world click here. I would also like to take this opportunity to thank to all the ones that have phoned, e-mailed or SMS me since yesterday asking about my family. You can't imagine what that means to me. Thank God my family and friends are all doing good, even though they are still very scared. Several of my friends work in the business area and you can imagine that having to go down by the stairs on a shaking building from the floor 19 is not funny. Fortunatly most of Lima buildings are built for this kind of situations so they stay put, but it's obviously not a nice experience to be there. Lets hope that things calm down and that the support can reach the victims in Ica soon. Pueden donar bolsas ya hechas para los niños damnificados pues no sólo no tienen casas, ahora no tienen nada. ¿qué meter en esas bolsas?
. y todo lo que se les ocurra. Estaremos recibiendo además de esto, todo tipo de donaciones (ropa, frazadas, comida no perecible, agua, medicinas), inclusive apoyo para el transporte de las mismas... si las empresas en las que trabajan quieren apoyar y no saben a través de quien enviar la ayuda llámennos. Todo esto lo entregaremos un grupo de Guías y estará bajo nuestra supervisión para evitar la viveza de gente inescrupulosa. La idea es congregar a los niños por intermedio de las Guías de las localidades más afectadas y nosotras personalmente entregarle a cada niño la bolsa y a sus familias el resto de donaciones. Si alguien puede hacer de nexo entre varias personas y quiere que se recojan las cosas de sus oficinas o de sus casas avísenme.